An Elk Grove bank was robbed shortly after 3 p.m. today. 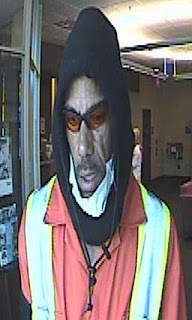 At approximately 3:07 p.m., the suspect (pictured above) entered the US Bank located at 9230 Elk Grove Florin Road Suite and approached a teller. The suspect told the teller that this was a robbery and demanded money. The teller complied with the demands gave the suspect an undisclosed amount of U.S. currency. 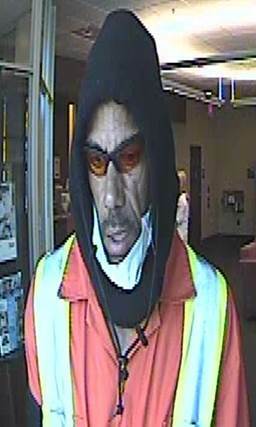 The suspect exited the bank and was last seen walking in a southbound direction from the bank. The suspect is described as an African-American male, approximately thirty to forty years of age (30-40), six feet one inches tall (6’1”), one hundred fifty pounds (150 lbs.). The suspect was wearing a dark colored hood, sunglasses, a white mask and a full length orange jumpsuit with yellow safety stripes. No weapons were displayed during the robbery.